"Faggiano Museum" is a private building open to the public in April 2008. It collects inside historical-archaeological evidences that contain a time span of more than 2000 years,from Messapi (V sec. B.C.) to Romans,from the Middle Ages to the Renaissance,in a tangible,visible and visitable historical route. The discovery of this place is quite incredible. Everything started almost by chance: in 2001 Mr. Luciano Faggiano, the property owner, was forced to break the floor of the house in order to change the sewer pipes that were causing continuous problems of humidity. It was precisely during such work that unexpectedly began to re-emerge the first archaeological evidences. It then continued with a long excavation work, lasted 7 years, made by Luciano and his three sons (Marco, Andrea and Davide) and financed entirely by Faggiano's family, under the supervision of the Archaeological Superintendence of Taranto. These excavation works rendered the house a real archaeological site,now available to all thanks to the Cultural Association "Idume", founded by Luciano Faggiano which is the person in charge of the preservation and management of the museum. From 1000 to 1200 this place was a Templar home, and later, up to 1600 it was a Convent of Franciscan Nuns of Saint Clare's order. 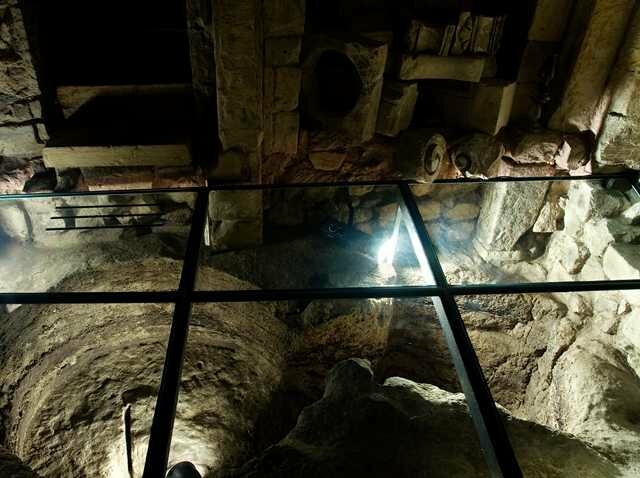 The excavation work brought to light tombs, granary, cisterns, hypogeums, a well, templar frescos, ossuary, underground escape ways, more then 5000 archaelogical finds and other incredible things. 2500 years of history, all just in one house.